Vancouver, British Columbia | Sandstorm Gold Ltd. (“Sandstorm” or the “Company”) (NYSE MKT: SAND, TSX: SSL) is pleased to report the attributable gold equivalent ounces sold during the third quarter of 2017 and recent updates from the Company’s royalty properties. Sandstorm sold approximately 14,290 gold equivalent ounces during the third quarter of 2017, the second highest quarterly total in Company history. The attributable gold equivalent ounces were delivered from 20 royalty assets. During the first 9 months of 2017 Sandstorm has sold approximately 42,600 gold equivalent ounces, consistent with the Company’s sales forecast for the 2017 year of between 50,000 and 55,000 gold equivalent ounces. The Company is forecasting attributable gold equivalent production of approximately 130,000 ounces per annum in 2022. Sandstorm has compiled a comprehensive resource to allow for investors to better familiarize themselves with the Company’s royalty portfolio. Version one of the Asset Handbook is now available and includes detailed information on Sandstorm’s producing and development-stage royalty assets. Subsequent versions of the handbook will include a discussion of the exploration properties. The Asset Handbook is available on the Sandstorm website at www.sandstormgold.com. a 1% NSR on the 9,030 hectare Idada gold and silver prospecting license located in the Barberton Greenstone Belt in the Mpumalanga province of South Africa. For more information visit the Tsodilo website at www.tsodiloresources.com and see the press release dated September 26, 2017. Yamana Gold Inc. (“Yamana”) provided an update on its exploration programs at the Cerro Moro gold-silver project in Argentina and the Chapada gold-copper mine in Brazil. MD2273: 2.2 metres of 119.8 g/t gold and 3,059.9 g/t silver from 228.1 metres. 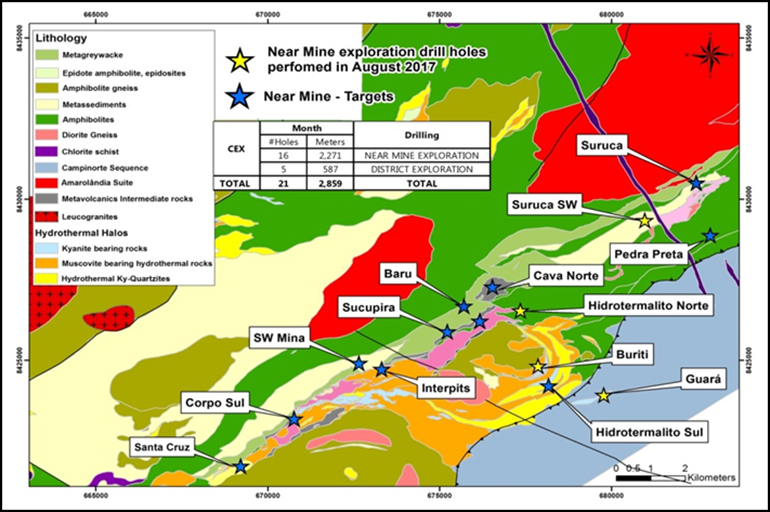 A 1,500 metre mineralized structure has been outlined that links the Esperanza and Escondida northwest mineral systems, and follow up drilling indicates mineralization remains open along strike and down dip, all of which suggests that further drilling should result in increases to Mineral Resources. Beginning in 2019, Sandstorm has a silver stream agreement to purchase an amount of silver from Cerro Moro equal to 20% of the silver produced, up to a maximum of 1.2 million ounces of silver annually, until Yamana has delivered to Sandstorm 7.0 million ounces of silver, then 9.0% of the silver produced thereafter for the life of the mine. Sandstorm will make ongoing payments for each ounce of silver received, equal to 30% of the spot price per ounce of silver. Exploration drill hole assay results for Cerro Moro includes all holes completed with results above 3.3 g/t AuEq. AuEq is calculated as g/t Au + (g/t Ag)/66.4. True widths not known at this time. Exploration efforts at Chapada have concentrated on increasing Mineral Reserves and Resources by testing near mine and district targets that include Baru, Suruca, Buriti and Formiga. A map of the targets is available at http://files.newswire.ca/1563/1102669_figure-1.jpg. The Baru target is a northeast to southwest trending mineral body adjacent to the north wall of the main Chapada pit. Exploration at Baru has identified a near surface, high grade core and studies are underway to review a larger open pit scenario at Chapada that includes the Baru and nearby Sucupria deposit. SU-963: 73.0 metres of 0.3 g/t gold, 0.24% copper from 63.0 metres including 20.6 metres of 0.6 g/t gold and 0.39% copper from 96.0 metres. New copper-gold mineralization was also identified three kilometres from the Chapada mine at the Buriti target which adds another near surface discovery at Chapada. The mineralization is identified over a two kilometre strike length with modest grade copper gold near surface. The mineralized intercepts at Buriti range from 17.0 metres to 58.0 metres down the hole. Drill testing at the Formiga target, 14 kilometres to the north of Chapada, has identified three distinct pods of high grade copper and gold mineralization that are under evaluation for further development. The deposits are all near surface and have the potential to generate Indicated Mineral Resources in 2017. Sandstorm has a copper stream agreement to purchase 4.2% of the copper produced at Chapada up to a maximum of 3.9 million pounds annually. When Yamana has delivered 39 million pounds of copper to Sandstorm, the copper stream will reduce to 3.0%. Once 50 million pounds of copper have been delivered to Sandstorm on a cumulative basis, the stream will reduce to 1.5% of the copper produced for the life of the mine. Sandstorm will make ongoing payments for each pound of copper purchased equal to 30% of the spot price of copper. A 0.25% CuEq cut-off grade was applied to all assays received from the Suruca Southwest target. CuEq is equal to % Cu + (g/t Au x 0.504). True widths not known at this time. For more information and for complete drill results visit the Yamana website at www.yamana.com and see the press release dated September 25, 2017. Columbus Gold Corp. (“Columbus”) has signed a Shareholder Agreement and entered into a formal joint venture with Nord Gold SE (“Nordgold”) with respect to the management and development of the Montagne d’Or gold deposit located in French Guiana. Under the terms of the joint venture, Nordgold is the project operator and a mine construction decision deadline was set for December 18, 2017. Sandstorm has a 1.0% NSR royalty on the Montagne d’Or project. For more information visit the Columbus website at www.columbusgoldcorp.com and see the press release dated September 26, 2017. Canadian Zinc Corporation (“Canadian Zinc”) has reported preliminary results from a Feasibility Study on its Prairie Creek Zinc-Lead-Silver project in the Northwest Territories, Canada. The study evaluated a 1,600 tonne per day underground mining operation that will process 8.1 million tonnes of Mineral Reserve material over a 15 year mine life. Average annual production is estimated to be 65,000 tonnes of zinc concentrate and 72,000 tonnes of lead concentrate containing 95 million pounds of zinc, 105 million pounds of lead and 2.1 million ounces of silver. The Feasibility Study indicates a base case Pre-Tax Net Present Value (“NPV”) of US$344 million using an 8% discount rate with an internal rate of return (“IRR”) of 23.8%. The post-tax NPV is estimated to be US$188 million with a post-tax IRR of 18.4%. The base case metal price assumptions used in the model are US$1.10/lb zinc, US$1.00/lb lead, US$19.00/oz silver with a foreign exchange rate of C$1.25/US$1.00. Pre-production capital costs, including a provision for a new all season road, are estimated at US$279 million, including a contingency of US$26 million. The post-tax payback of the initial capital costs is 4.6 years from the commencement of concentrate production. Canadian Zinc has also announced that the Mackenzie Valley Environmental Impact Review Board recommended approval for the proposed All Season Road at Prairie Creek. The next permitting stage before the permit is issued is the regulatory phase conducted by the Mackenzie Valley Land and Water Board with input from territorial and federal agencies. Development of the all season road will enable the transportation of concentrates and supplies throughout the year. The road also has the potential to enable the use of liquid natural gas which would reduce energy costs and the environmental impact of the project. Sandstorm has a 1.2% NSR royalty on the Prairie Creek project. For more information visit the Canadian Zinc website at www.canadianzinc.com and see the press releases dated September 28, 2017 and September 12, 2017. A Technical Report in support of the 2017 Feasibility Study prepared in accordance with National Instrument 43-101 Standards for Disclosure for Mineral Projects will be filed on SEDAR within 45 days of the September 28, 2017 press release. Erdene Resource Development Corp. (“Erdene”) announced additional assay results from their ongoing 2017 drill program at the Bayan Khundii project in southwest Mongolia. A total of 19,386 metres have been drilled in 2017 and during the fourth quarter Erdene will be testing a series of geophysical and geochemical targets within the larger Bayan Khundii prospect area. BKD-30ext: 58.0 metres of 1.2 g/t gold from 59.0 metres including 16.0 metres of 2.8 g/t gold from 87.0 metres. The results from Phase I metallurgical testing at Bayan Khundii has come back positive with two master composites indicating that gold from the project is free milling and amenable to conventional processing techniques. Sandstorm has a 2.0% NSR royalty on Erdene’s Bayan Khundii and Altan Nar projects. Reported intervals are not true width. For more information and for complete drill results visit Erdene’s website at www.erdene.com and see the press releases dated September 14, 2017 and September 12, 2017. BRAZD546: 13.0 metres of 1.9 g/t gold from 3.0 metres including 3.0 metres at 5.6 g/t gold from 10.0 metres. Trek recently commenced an aggressive second phase of exploration drilling at Aurizona and has five diamond drill rigs working to complete a 12,000 metre drill campaign. The focus of the campaign is to test several high-potential near-mine targets including follow-up drilling at Genipapo and additional infill drilling at Piaba West. Sandstorm has a 3.0% - 5.0% sliding scale NSR royalty on the Aurizona project. At gold prices less than or equal to US$1,500 per ounce, the royalty is a 3% NSR. In addition, Sandstorm holds a 2.0% NSR royalty on the Aurizona Greenfields property, a 190,073 hectare package of exploration ground adjacent to the Aurizona project. Trek recently announced an exploration agreement with AngloGold Ashanti Limited (“AngloGold”), whereby AngloGold may invest US$14 million in exploration to earn a 70% interest in Aurizona Greenfields. True widths of the mineralized intervals are interpreted to be 60 to 90 percent of the reported lengths. For more information and for complete drill results visit the Trek website at www.trekmining.com and see the press release dated September 12, 2017. BA-17-32: 4.0 metres of 5.6 g/t gold from 901.0 metres. Stated lengths are core width as drilled, true widths vary and average between 60 and 80 percent of drilled widths. For more information and for complete drill results visit the Bonterra website at www.bonterraresources.com and see the press release dated September 18, 2017. Sandstorm holds a 1.0% NSR on the West Arena portion of the Gladiator Gold Deposit. Keith Laskowski (MSc), Sandstorm’s Vice President, Technical Services is a Qualified Professional (#01221QP) of the Mining and Metallurgical Society of America and a Qualified Person as defined by Canadian National Instrument 43-101. He has reviewed and approved the technical information in this press release. Sandstorm Gold Ltd. is a gold royalty company. Sandstorm provides upfront financing to gold mining companies that are looking for capital and in return, receives the right to a percentage of the gold produced from a mine, for the life of the mine. Sandstorm has acquired a portfolio of 164 royalties, of which 20 of the underlying mines are producing. Sandstorm plans to grow and diversify its low cost production profile through the acquisition of additional gold royalties. The financial information included or incorporated by reference in this press release or the documents referenced herein has been prepared in accordance with International Financial Reporting Standards as issued by the International Accounting Standards Board, which differs from US generally accepted accounting principles (“US GAAP”) in certain material respects, and thus are not directly comparable to financial statements prepared in accordance with US GAAP. Information contained or referenced in this press release or in the documents referenced herein concerning the properties, technical information and operations of Sandstorm has been prepared in accordance with requirements and standards under securities laws, which differ from the requirements of US securities laws. The terms “mineral resource”, “measured mineral resource”, “indicated mineral resource” and “inferred mineral resource” used in this or in the documents incorporated by reference herein are mining terms as defined in accordance with NI 43-101 under guidelines set out in the Definition Standards for Mineral Resources and Mineral Reserves adopted by the Canadian Institute of Mining, Metallurgy and Petroleum Council on 11 December 2005. While the terms “mineral resource”, “measured mineral resource”, “indicated mineral resource” and “inferred mineral resource” are recognized and required by securities laws other than the requirements of US securities laws, they are not recognized by the SEC. Disclosure of contained ounces are or may be permitted disclosure under regulations applicable to Sandstorm; however, the SEC normally only permits issuers to report resources as in place tonnage and grade without reference to unit of production measures. As such, certain information contained in this document or in the documents incorporated by reference herein concerning descriptions of mineralization and mineral resources under these standards may not be comparable to similar information made public by US companies subject to reporting and disclosure requirements of the SEC. This press release contains "forward-looking statements", within the meaning of the U.S. Securities Act of 1933, the U.S. Securities Exchange Act of 1934, the Private Securities Litigation Reform Act of 1995 and applicable Canadian securities legislation, concerning the business, operations and financial performance and condition of Sandstorm. Forward-looking statements include, but are not limited to, statements with respect to the future price of gold, the estimation of mineral reserves and resources, realization of mineral reserve estimates, and the timing and amount of estimated future production. Forward-looking statements can generally be identified by the use of forward-looking terminology such as “may”, “will”, “expect”, “intend”, “estimate”, “anticipate”, “believe”, “continue”, “plans”, or similar terminology. Forward-looking statements are subject to known and unknown risks, uncertainties and other important factors that may cause the actual results, level of activity, performance or achievements of Sandstorm to be materially different from those expressed or implied by such forward-looking statements, including but not limited to: the impact of general business and economic conditions, the absence of control over mining operations from which Sandstorm will purchase gold and risks related to those mining operations, including risks related to international operations, government and environmental regulation, actual results of current exploration activities, conclusions of economic evaluations and changes in project parameters as plans continue to be refined, risks in the marketability of minerals, fluctuations in the price of gold, fluctuation in foreign exchange rates and interest rates, stock market volatility, as well as those factors discussed in the section entitled “Risks to Sandstorm” in Sandstorm’s annual report for the financial year ended December 31, 2016 available at www.sedar.com. Although Sandstorm has attempted to identify important factors that could cause actual results to differ materially from those contained in forward-looking statements, there may be other factors that cause results not to be as anticipated, estimated or intended. There can be no assurance that such statements will prove to be accurate, as actual results and future events could differ materially from those anticipated in such statements. Accordingly, readers should not place undue reliance on forward-looking statements. Sandstorm does not undertake to update any forward looking statements that are contained or incorporated by reference, except in accordance with applicable securities laws.